(18/P109) TRENTON – Seaside Heights has six new electric-vehicle charging stations in its downtown area as part of a settlement agreement reached with the New Jersey Department of Environmental Protection to resolve air-monitoring issues in the borough, Commissioner Catherine R. McCabe announced today. 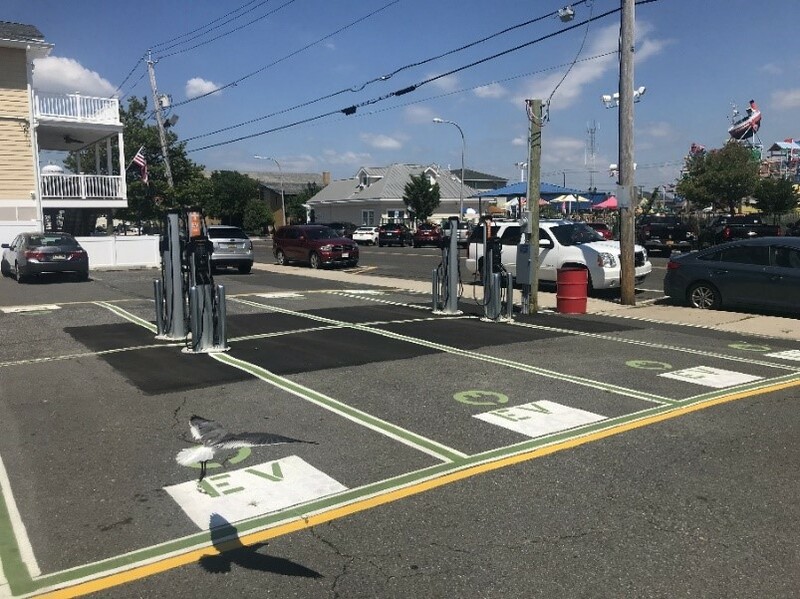 Installation of the dual-port charging stations benefits the public by expanding the state’s electric-vehicle charging station infrastructure, promoting the use of electric vehicles and aligning with Governor Phil Murphy’s initiatives to move New Jersey toward 100 percent clean energy by 2050. The DEP and Seaside Heights reached a settlement agreement in August 2017 after DEP Air Compliance and Enforcement inspections found the Ocean County borough out of compliance with numerous emissions and monitoring requirements in the operation of three diesel generators at the intersection of Sherman Avenue and Bay Boulevard. The generators provide power to the borough. 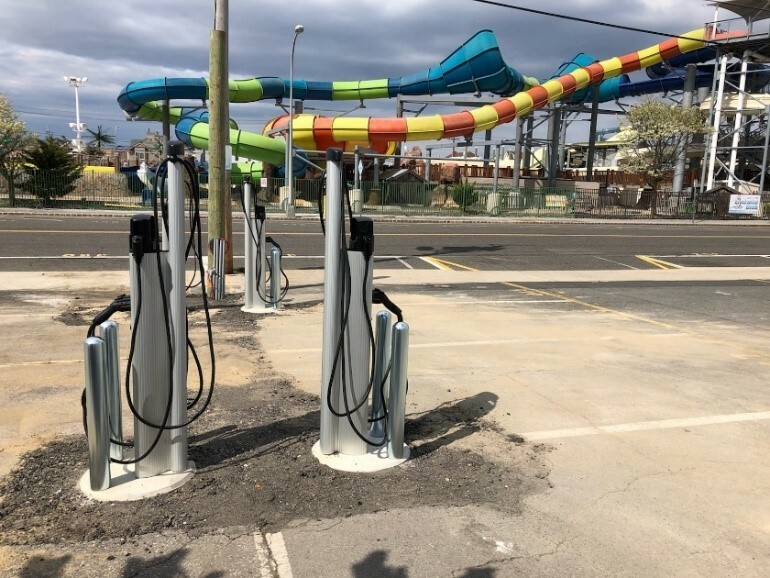 As part of its settlement with the DEP, which included a penalty of $95,600, the borough agreed to implement a Supplemental Environmental Project and install the charging stations at a cost of $71,700. Supplemental Environmental Projects are environmentally beneficial projects that are done voluntarily as a condition of settling an enforcement action. The borough paid the $23,900 penalty balance to the state. Each of the six charging stations can charge two vehicles at the same time. Four charging stations are in the municipal lot at 55 Grant Ave., and two stations are in the Ocean Terrace lot at 21 Hancock Ave. Both lots are within one block of the beach, boardwalk and other attractions. Charging fees at the stations are $1.50 for the first hour, then $2 per hour thereafter. Parking rates will be discounted for electric vehicles charging at either lot. Electric vehicle owners can use the ChargePoint app to track their vehicles’ battery percentage and the amount of greenhouse gas emissions avoided. The app, available for iPhone and Android users, also allows users to locate local charging stations. By 2023, the six stations will prevent emissions of an estimated 300 pounds of volatile organic compounds that contribute to ground-level ozone formation, as well as about 50 tons of carbon dioxide, the most prevalent greenhouse gas. Each ton of carbon dioxide avoided is equivalent to planting approximately 24 trees, according to the ChargePoint app. ChargePoint manages the six stations. Emissions from transportation are a significant concern in New Jersey because cars and light trucks cause about 30 percent of ozone-forming air pollutants and more than 40 percent of greenhouse gas emissions. Ground-level ozone – or smog – is the state’s most persistent health-related air pollution problem. Ozone worsens chronic lung illnesses such as asthma and emphysema, particularly in vulnerable populations including children and senior citizens. New Jersey has been pursuing the benefits of electric vehicles for several years, starting with the 2016 launch of the “Drive Green New Jersey” initiative and the It Pay$ to Plug In – New Jersey’s Electric Vehicle Charging Grant Program, which to date has awarded nearly $1 million in grants. In May, Governor Murphy signed the Multi-State Zero-Emission Vehicle memorandum of understanding, for which New Jersey works collaboratively with eight leading states to support the deployment of zero-emission vehicles. In total, New Jersey has more than 600 public chargers at 250 locations. Five New Jersey highways also have been federally designated as “Electric Vehicle Corridors,” where fast chargers allow for easy electric travel. Interstates 95, 295, and sections of Interstates 80, 78 and 287 connect to electric vehicle corridors in neighboring states and throughout the Northeast and Mid-Atlantic regions. For more information about Supplemental Environmental Projects through the DEP’s Division of Compliance and Enforcement, visit www.nj.gov/dep/enforcement/seps.html. To learn more about electric vehicle choices, state and federal incentives, charging options and charging station locations, as well as information for charging station hosts, visit www.drivegreen.nj.gov. For information about It Pay$ to Plug In – New Jersey’s Electric Vehicle Charging Grant Program, visit www.drivegreen.nj.gov/plugin.html. For more about the DEP’s Division of Air Quality, Energy and Sustainability, visit www.nj.gov/dep/daq/.